Store up to 3000 of e-books in the super-light and ergonomic device, make notes and translate easily, take advantage of cloud-reading and, of course, appreciate the merits of eye-friendly E Ink screen of latest generation. 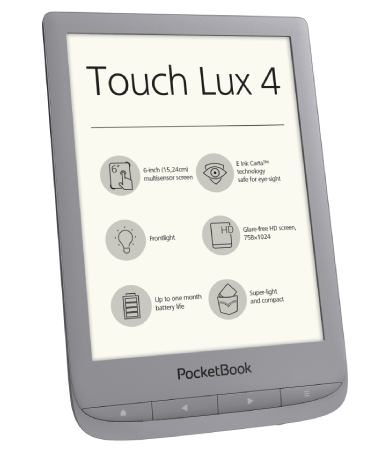 PocketBook Touch Lux 4 is more than just a device, but a personal reading space with all needed to satisfy a real book-lover. PocketBook Touch Lux 4 is equipped with capacitive multisensory E Ink Carta™ display with HD resolution (1024 × 758) and built-in frontlight allowing the most comfortable round the clock reading. 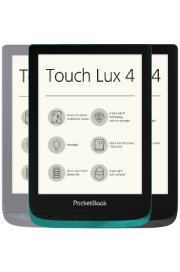 PocketBook Touch Lux 4 supports 17 book formats without converting and 4 graphic formats, such as JPEG, BMP, PNG, TIFF. The built-in Wi-Fi together with PocketBook Cloud, Dropbox PocketBook and Send-to-PocketBook features allow easily deliver the e-content onto the e-reader without connecting it to a PC. The preinstalled Abbyy Lingvo® dictionaries offer 24 language combinations for reading books in foreign languages. The e-reader has a cover sensor that offers an opportunity to use “sleep function” and save the battery charge with one of brand PocketBook accessories compatible with this particular model. Thanks to the new refined design the e-reader is also intended for those who are demanding to style. All the elements of the e-reader harmoniously emphasize each other’s elegance and perfectly merge into one. With the weight of only 155 grams and dimensions of 161.3 × 108 × 8 mm, the e-reader suits standard jeans pocket and the tiniest lady’s purse. Traditionally for PocketBook products the e-reader received convenient paging buttons for those, who prefer to control device manually. The increased RAM of 512 MB and a powerful 1 GHz processor guarantee prompt response of services and applications. The e-reader has 8 GB of internal memory and slot for microSD card (up to 32 GB), which means a user may store of up to 3000 of e-books in its digital library.